There are at least two artists which have used the name Hanson 1. A pop rock group from Oklahoma, United States 2. A funk rock group from the United Kingdom active in the 1970's. 1. Hanson is an American pop rock band from Tulsa, Oklahoma. The band consists of guitarist and vocalist Isaac Hanson, pianist and vocalist Taylor Hanson, and drummer and vocalist Zac Hanson. Their work has spanned many different genres, including rock, blues, folk, and pop. 2. A funk rock group from the United Kingdom active in the 1970's. 1. Hanson is an American pop rock band from Tulsa, Oklahoma. The band consists of guitarist and vocalist Isaac Hanson, pianist and vocalist Taylor Hanson, and drummer and vocalist Zac Hanson. Their work has spanned many different genres, including rock, blues, folk, and pop. They are most noted for their Grammy-nominated 1997 hit single, ?MMMBop.? Their 1997 album Middle of Nowhere (the band's third recorded album and first major studio album, also nominated for a Grammy) was met with critical acclaim and went on to achieve multi-platinum status. The group's subsequent major effort, This Time Around showcased the brothers' considerable talent and artistic growth, receiving wide critical acclaim for its bluesy/classic-rock and soulful pop harmonies. The album failed to repeat the commercial success of Middle of Nowhere however, only achieving gold status. The album has since been considered a trend-setter and precursor for such acts as Michelle Branch, John Mayer, Avril Lavigne, Paramore, Vanessa Carlton and Eisley. After many promotional and artistic conflicts with Island/Def Jam, Hanson split from the label in 2003 and started their own label, 3CG Records. In 2004, they released their third major studio album, Underneath, independently. The album reached #1 on Billboard's Independent Album Chart and has since been noted as one of the biggest-selling independent albums of all time. The single ?Penny & Me? reached #2 on Billboard's Top 200. Like This Time Around, Underneath was well-received and well-reviewed for its more mature classic rock/pop sound. The band continues to have a dedicated fan base and Internet presence, and recently completed a tour of college campuses, showing a documentary, Strong Enough to Break, made about their struggle to form their own label and release Underneath. The documentary http://www.last.fm/music/Hanson was also shown at the Hollywood Film Festival in October 2006. A live album (The Best of Hanson; Live & Electric), recorded in Melbourne on the Australian leg of the ?Underneath: Live & Electric? tour was released in October 2005. The band released of their fourth major studio album, The Walk in North America on July 24th, 2007. They have released a second documentary, titled Taking The Walk as a continuation of their struggles and successes of writing, recording and producing their own album. After spending some time in Africa, Hanson released a single ?Great Divide? for World AIDS Day, with 100% of the download proceeds going to the Perinatal HIV Unit at Chris Hani Baragwanath Hospital in Soweto, South Africa. During the making of The Walk, Hanson made a trip to Africa to record some tracks with the African Children's Choir. They were so inspired by their experiences there that they have since teamed up with TOMS Shoes--a california-based company who donates a pair of shoes for each pair sold to a child in poverty who does not have shoes. In order to raise awareness for this charity and the daily things we take for granted, as well as small and impactful ways to help those in need, Hanson organizes one mile barefoot walks before each of their shows. As of 10/30/08 they have walked a total of 100 miles together with their fans. They are donating $1 for each person who walks with them to one of 5 causes to help children and monthers in Africa battling AIDS and poverty. The fans are invited to organize their own walks and Hanson will also donate a dollar to whatever cause they are walking for. The goal is to Walk around the World and as of 2/4/2009 have walked 19,236 miles and have 5,666 to go. 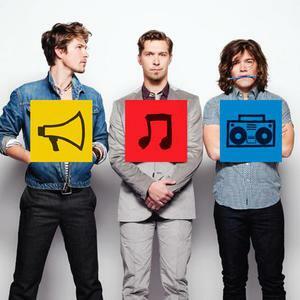 Hanson released their 5th studio album entitled "Shout It Out" on June 8, 2010. Leading up to this release they performed all of their albums at 5 sold out shows at the Gramercy Theater in New York City. 2. Hanson is a funk rock band formed in 1973 by reggae musician Junior Marvin. The group released two albums - "Now Hear This" (1973) and "Magic Dragon" (1974) before disbanding in 1974.